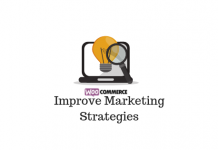 Consistent marketing efforts help to ensure that your WooCommerce store is creating a perpetual buzz among your potential customers. You already know about the various strategies you can try to improve sales. However, to consistently keep on top of your marketing goals, you may need to use a variety of tools. These tools would ensure that your marketing efforts are streamlined. And, they ensure your marketing efforts go on as planned, even if your focus is shifted to some other aspects of store management. 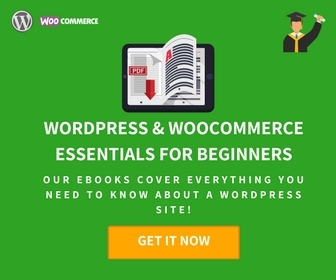 This article intends to provide you a list of top WooCommerce plugins for marketing your WordPrss eCommerce store. WooCommerce plugins for marketing are scattered around different functionalities that won’t even have any apparent similarities on the first look. Let’s take a glance at some of the popular ones that might be really useful for your store. First, let’s take a look at some of the plugins that will help you offer discounts on your store. 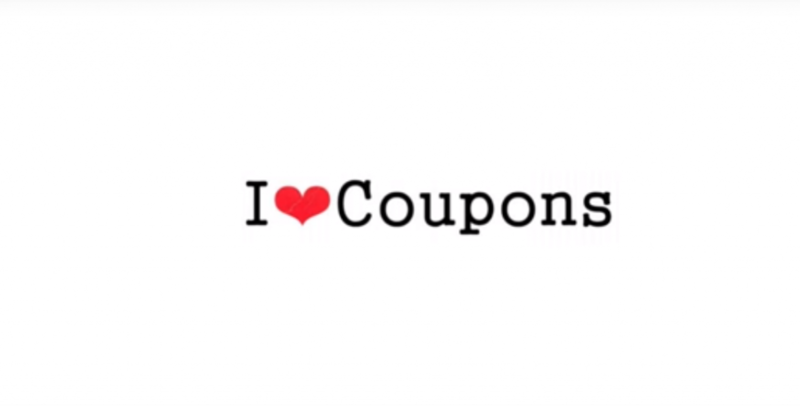 Coupons are a great way to offer discounts on your WordPress eCommerce store. 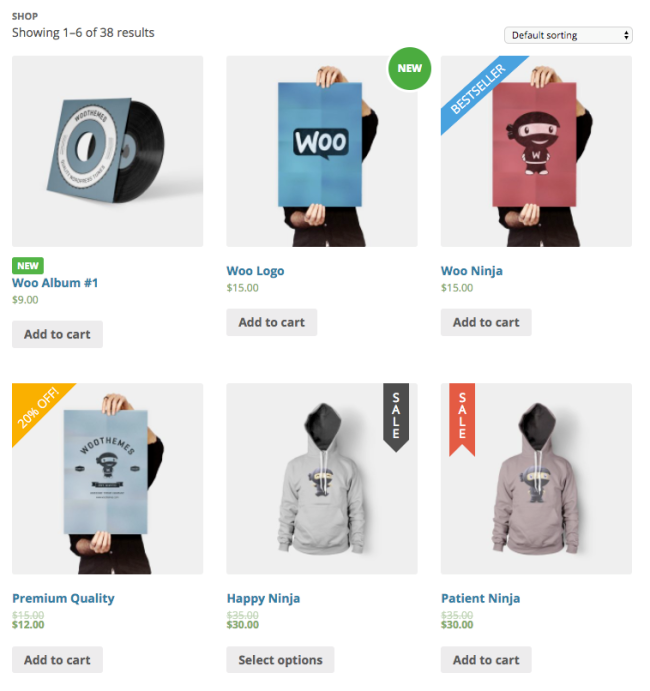 WooCommerce provides extensive options to create and manage coupons. However, Smart Coupons is one of the WooCommerce plugins for marketing that will help you do more. This extension helps you generate coupons in bulk, and provides an option to apply these coupons in a single click. You will be able to automatically issue coupons to customers when they purchase certain specific products. Also, you can allow customers to purchase credits or gift coupons, or provide coupons embedded in a link. Moreover, you can personalize all coupons on your store with your own unique branding. WooCommerce Smart coupons is a comprehensive solution to manage coupons on your store. Gift coupons are really popular these days as it offers receivers a chance to select their own gifts. However, some may argue that it takes away the personal charm of a well-thought-out gift, but for the rest, it is a risk-free option. Smart coupons extension allows your customers to send gift coupons to multiple people with custom messages. Buying a credit from your store means the customers are finding value to come back and purchase something from your store later. It helps immensely to improve customer engagement and repeat purchases. You can easily offer store credits to customers using this extension. Offering a discount coupon for the next purchase is a definitive way to ensure repeat purchases on your store. Smart Coupons extension helps you to automatically set this up. So, you can forget about it once set up, and improve conversions effectively. Smart coupons extension also offers great options to personalize your coupon design. You can insert the coupon into the content editor using an insertion tool, and keep complete control of the design via CSS. 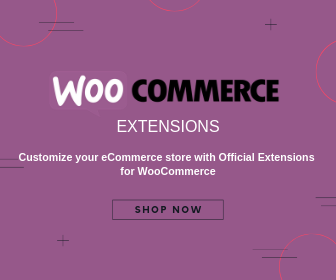 The extension offers seamless integration with WooCommerce, and you can really enhance your discount strategies with it. Be it during a seasonal promotional drive, or a targeted marketing campaign, this tool can prove quite handy. You can purchase a single site subscription for $99. 5 site and 25 site subscription come for $129 and $199 respectively. Dynamic pricing plugins help setting up changing prices according to the number of items bought or specific customer roles. They are really useful to promote larger purchases and even cross-selling of related products. You can create bulk offers for individual products by creating a table of discounts. There is an option for a fixed price or percentage adjustments, and even role specific rates. You can also set price adjustments based on category or cart rules. ELEX Dynamic Pricing plugin offers great options to set up dynamic pricing at product, combination, cart and category levels. What all you can do with ELEX Dynamic Pricing plugin? Offers discounts based on product, variation, combinations, cart items, category, quantity, weight, price or user roles. Set percentage or flat discounts, or a fixed price. Set a maximum value to make sure the discount would not exceed your estimates. Restrict discount by date of purchase or a range of dates. Offer special discounts for repeat customers based on the number of orders made previously, or the total order value. Give special discounts exclusively to certain email ids. Option to choose which rule applies when multiple ones are applied together. Drag and drop feature to change the order of execution. Repeat rules every time a customer purchases a certain number of products. Customize the pricing format for variable products. Display all the rules associated with a particular product in a pricing table on the product page. You can get this plugin for $69 for a single site license. A 5-site license is for $99 and a 25-site license is for $199. Here are couple of options that will help to optimize your marketing strategy. Omnisend is an email and marketing automation tool. Its deep integration with WooCommerce allows you to collect valuable data about your customers’ shopping behavior and use it for better personalization and segmentation, ultimately bringing you more sales and higher revenue. Omnisend is a comprehensive solution that will help you get in touch with potential customers across multiple channels. Email marketing can be a limitation for businesses hoping to expand. 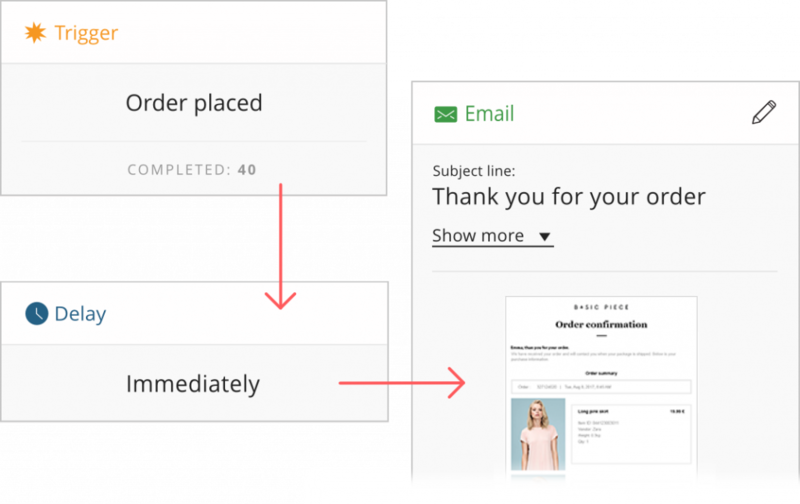 If you’re growing and are looking for some great MailChimp alternatives for more advanced ecommerce marketing automation, Omnisend can be an option. With Omnisend, you can take a giant step ahead and use omnichannel communication features – SMS marketing, Facebook Custom Audiences, and Google Customer Match. The seamless integration with WooCommerce lets you set up Omnisend automation workflows, contact forms and landing pages, even without any programming skills. It’s really an all-in-one eCommerce marketing solution that delivers on its promises to make you more sales. Sales Pop – the most outstanding free app in the Beeketing plugin – will help you create beautiful recent sales pop ups to notify visitors of the recently bought items. When visitors are aware that many other customers are buying from this brand, they will be more confident in making the first purchases. Keeping a countdown timer for your offers and discounts can create a sense of urgency among your customers. Boost Sales – the top performing premium app that helps upsell & cross-sell relevant products based on the customer’s cart, bundle products in combo and sell at a total discounted price. Once installed, the whole Beeketing plugin follows your visitors right when they land the first step on your WooCommerce store, gradually drive them down the conversion funnel, then turn them into loyal customers for you. Email is one of the most effective marketing strategy for eCommerce business owners. Targeted email campaigns are able to improve conversions on your store quite impressively. But how will you manage this when your customer base is ever increasing and becoming diverse by the day? Here are a couple of tools that will help you with your email campaigns. 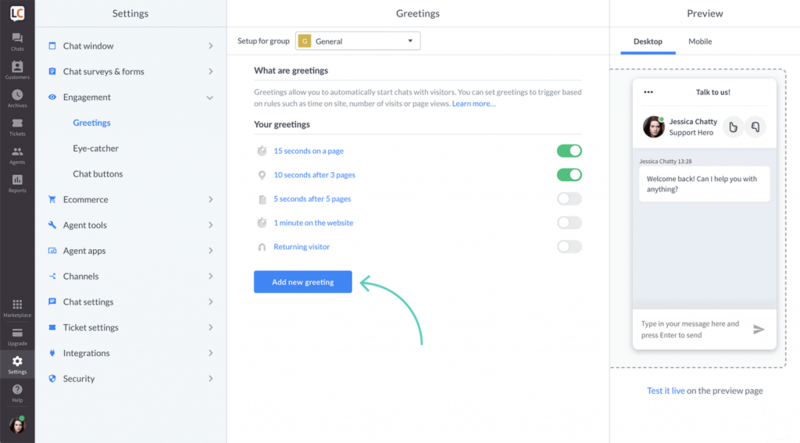 Mailchimp is a marketing automation platform that automates your connections with customers. It helps immensely in brand building and sales improvement. With over 16 million customers, it is the largest of its kind. WooCommerce offers free integration with MailChimp, which helps to synchronize your customer data with your MailChimp account. Once you synchronize the data, you can easily send targeted campaigns, product recommendations and follow up emails to customers. Additionally, it can very well help you recover abandoned carts and gauge the return of investment (ROI) of your business development initiatives. Mailchimp is a global leader in marketing process automation, and syncing your WooCommerce store with it is an essential step for customer engagement. Send reminders to customers on viewed items, or items on the cart. Send follow up emails to customers after purchase. Track customers based on their purchase history and frequency. View your marketing performance metrics. Initiate social media campaigns in Mailchimp. Embed a form to change customers to subscribers. You can download this valuable marketing automation tool from WooCommerce for free. The newsletter subscription extension for WooCommerce allows integration with MailChimp and CampaignMonitor. With the help of this extension, your customers can signup to different lists that you choose. Additionally, this extension comes with widgets to display signup form on the sidebar and display recent subscriber activity on your site. You can easily gather analytics insights on your email campaigns as well. Follow up emails are a great way to maintain customer engagement on your store. After a purchase, sending an email to check if the customer is satisfied with your product would help a lot. Your customers would feel like you care, and it would increase the chances of getting a feedback too. According to marketing experts, email marketing is still one of the most efficient growth drivers for businesses. WooCommerce Follow Ups extension helps you automate your communication channel with your customers. In addition, it helps to send Twitter follow-ups too. Overall, it enhances your email system to ensure you are always on track with your marketing efforts. 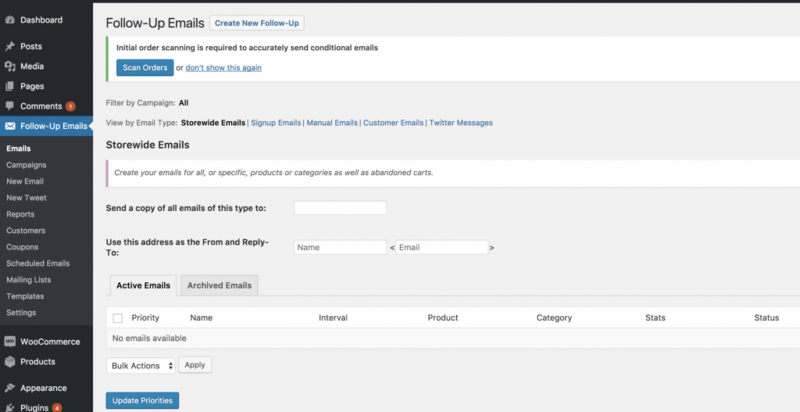 Create emails easily using the WordPress editor. Customize templates and personalize email messages. Send personalized follow-up tweets to customers. Group your follow up emails and tweets to build a campaign. Get a comprehensive view of all your campaigns – past, present and future. Get detailed analytics reports to understand the performance of your campaigns. 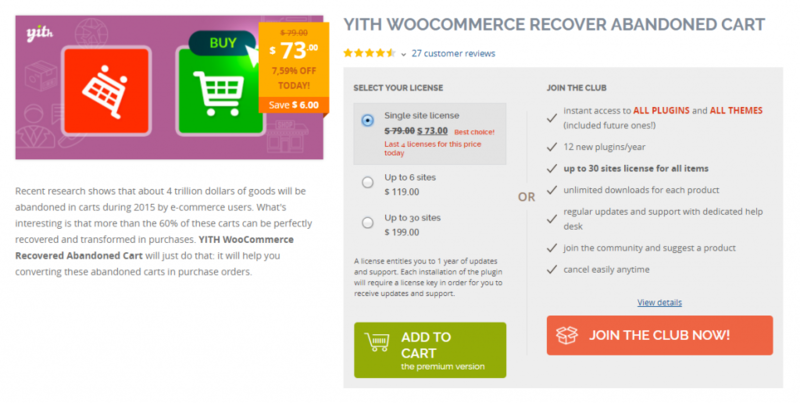 You can purchase the plugin from the WooCommerce site for $99 for a single site subscription. 5 sites are $149 and 25 sites is $249. With the purchase, you get one year of updates and dedicated support. You can add your WooCommerce store products to Google Merchant Center feed for better visibility. Once you add these products to Google feed, they will be displayed as Google Shopping results. This will help to improve sales on your site considerably. Here is a tool that will help you mange this. Google Merchant Center helps you make your product information visible to Google shopping and other services. You need to have a merchant center account in order to place advertisements of your products on Google. WooCommerce Google Product Feed Extension helps you create a real-time feed to provide product information to Google Merchant Center. Advertising on Google can increase the visibility of your products by many dimensions. Google has certain guidelines regarding what all fields to include in your product feed. This extension helps you arrange the data on your products and variations in the specified format. Actually, it automates the entire process of providing a product feed to Google. It even captures any additional data requirements by making use of its additional data entry fields. You can apply the information specifics to all products in your store, or only to certain categories. Google Product Feed Extension is compatible with Product Import Suite, and hence it is quite easy to import information in bulk. You can purchase the extension for $79 for a single site, $99 for 5 sites and $199 for 25 sites. Remember, this extension does not support WooCommerce subscriptions or bookings. This is another plugin that you can use to submit a product feed to Google Merchant Center. You can create an XML file including all the required fields mandated by the field. The plugin offers an option to add and manage additional fields according to the requirements as well. You can also automate a periodic update of the product feed by specifying a daily, weekly or monthly cron job. The single site subscription of the plugin is priced at $69. With the help of ELEX Product Feed plugin, you can map multiple Google categories to relevant categories on your WooCommerce store. As you know eCommerce customers look for validation from fellow customers for every product they purchase. It is one of the fundamental factors that can influence a purchase decision. As per studies, around 70% of users on eCommerce sites look at product reviews before making a purchase. Offering extensive options for product reviews is a must on any WooCommerce store. It is common knowledge in the eCommerce landscape that product reviews increase the chances of sales conversion on your site. According to studies, more than 60% of customers feel they are more likely to purchase from a store that has reviews. Over 85% eCommerce customers said they would read product reviews before purchasing a product. Your core WooCommerce install has a set of good options to set up product reviews. You can read more about product review settings here. However, WooCommerce Product Reviews Pro helps to add more capabilities and better filtering options to your reviews. In addition, you can encourage users to upload images and videos of their purchased products. Product Reviews Pro helps you enhance the review strategy on your store. With the help of this extension, you can add specific review questions that help potential customers understand your product better. You will also have the control to decide what type of reviews your customers can post. For example, you can choose to not enable video reviews on your site. You can apply several strategies to keep up the interest level of customers on your products. Here are some WooCommerce plugins for marketing that will help you in this regard. You may create different marketing campaigns to promote specific products or your entire store. How about having a little help to promote your promotions? 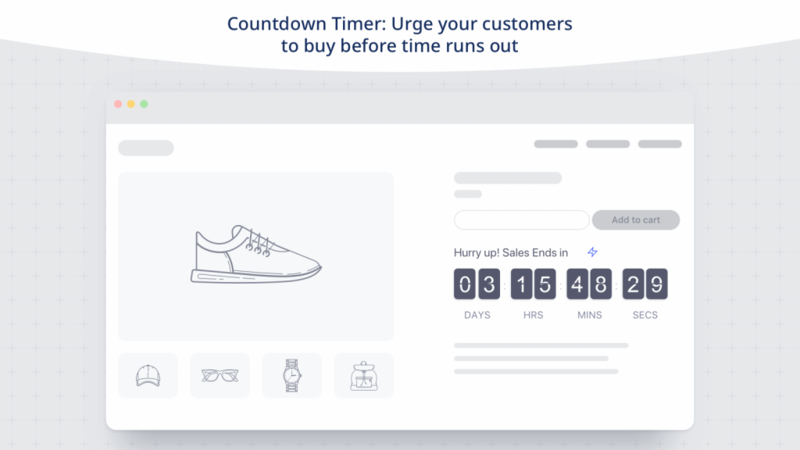 With the help of WooCommerce Sales Countdown plugin, you can display a counter on the product page. The counter informs the customer how much time left to purchase the product before the deal gets expired. This is a great way to encourage customers to buy products from your store. Additionally, it displays a countdown timer to inform your customers about any upcoming sales on your store. Offering customers an option to create their wishlist on your site would open great possibilities for customer engagement and sales conversions. Mostly, when customers don’t want to immediately go ahead with a purchase, they can add that product to wishlist to buy later. For customers, it is a good way to manage their shopping for their birthdays, anniversaries, etc. as well. It is quite easy to share the wishlist with friends and family too. The WooCommerce Wishlist extension helps you to allow your registered customers to save their wishlist for 30 days. Moreover, customers can create unlimited wishlists, which is great. Overall, this extension offers a great way to continuously engage customers in your store. Needless to say, it is annoying for your customers to see the desired product out of stock. However, you can turn that annoyance to a successful purchase with the help of this extension. The plugin helps you track the demand for out-of-stock products on your store. And, when the product comes back in stock, it automatically notifies your customers. Basically, the plugin creates a wait list of customers who are interested in a specific product. So customers more probably will wait some time for the product to come back in stock rather than choosing an alternate option. Without proper efforts to display deals on your WooCommerce store, your offers won’t really reach customers. This is an extension that would be really helpful to grab your customer’s attention with custom product labels. Displaying different labels on your product information would be a really great way to improve conversions on your store. Displaying diverse product labels on your store would be a great way to catch attention of shoppers, particularly during the holiday season. You can put a label on your best selling products or those products that are on sale. Or, you will be able to show the discount amount or percentage associated with each product. The accurate amount will be automatically calculated by the plugin. If you want to display a ‘New’ label on products, you can specify a date. And all products added to your store after this date will have the label. The plugin allows to choose six different type of product labels. You can use the predefined colors or choose different colors to suit the color scheme of your website. Product labels can be created at individual product level as well as for multiple products on a global level. You will find a range of conditions available with the product by default. However, if you want to add more conditions, you can manage those using hooks. For this, you need to have coding knowledge or the help of an expert though. The plugin would cost you $49 for a single site subscription. The 5-site subscription of the plugin would be $99 and the 25-site subscription would be $149. During a holiday season, there are chances that a lot of customers would add products to the cart and then don’t complete the purchase. This can be a really bad scenario for your store as a huge amount of sales can be lost in cart abandonment. Here is a plugin that will help you to remind customers about the purchase they have left behind. With the help of this plugin, you can create a user role based strategy to send targeted messages to certain groups of customers. With the help of this plugin, you can devise effective strategies to recover abandoned cart. You can even save the carts of unregistered users, so that you will be able to add new customers, particularly during the holiday season. The plugin allows to create customized templates with targeted messages for specific customer groups. And, you will be able to change the text manually for individual email, if that is required in a particular scenario. The plugin will also help you add a discount coupon on the email so that you can pursuade the customer to go ahead and finish the order. For each of the successful conversion from abandoned carts, you will get a notification to be aware of the success rate of your campaigns. Moreover, the plugin offers detailed reporting features as well. A single site license of the plugin would cost you €79,99. The 6-site license is €99,99 and the 30-site subscription is €169,99. Rewarding your loyal customers should be a priority for online stores that look for long term prospects. If you have a reward system in place for such customers, it would encourage them to purchase more from you. There are several ways to manage this on a WooCommerce store. 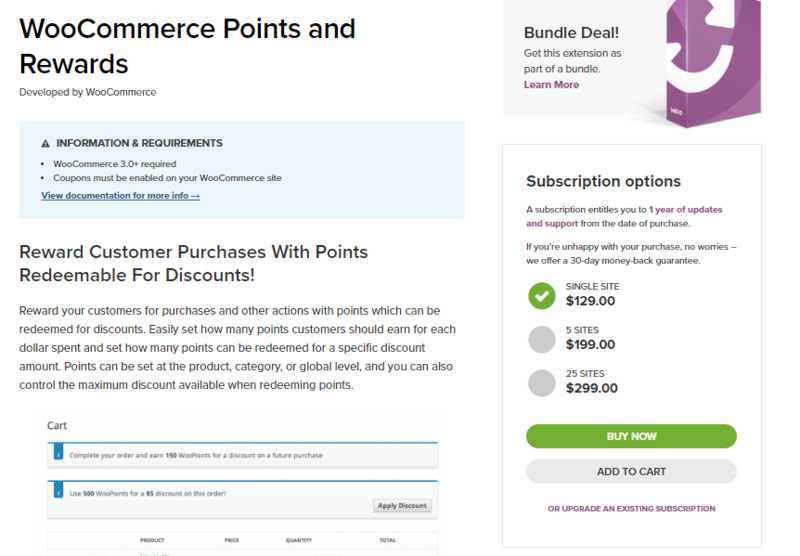 This plugin helps you set up a point system for your customers based on their purchases. Every time a customer makes a purchase, or perform an action, like leaving a review, you can assign a certain number of points to them. They will be able to get discounts based on the number of points they amass over a period of time. On the plugin settings you can define how the point system works. For example things like how many points will be allotted for a certain amount spent on your store, or how many points will be redeemed for a certain discount percentage, etc. You can define points at product, category and global levels, according to your strategy. To make sure, this won’t eat into your profits, you can set a maximum discount value that can be availed while redeeming points. You will find a page to manage customer’s points, where you can easily adjust the points redeemed. It will reflect on the My Account page of the customer as well. 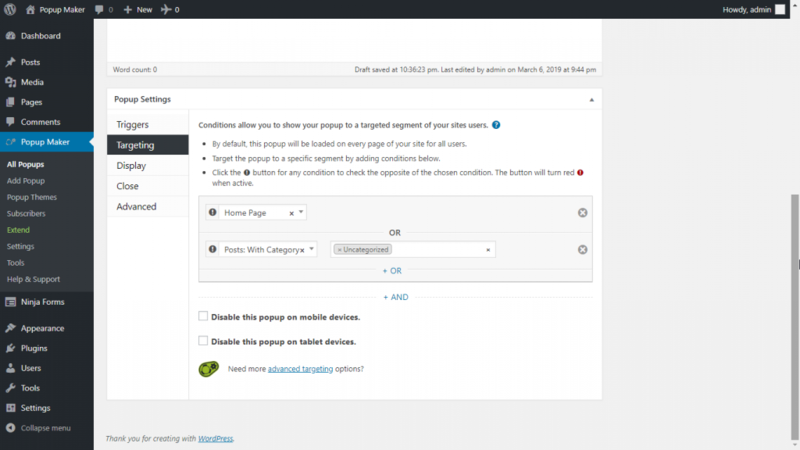 The plugin also offers good options for customization as well. The single site subscription of the plugin is $129. The 5-site subscription is $199 and 25-site subscription is $299. One of the definite ways to please your customers would be to offer a live chat window on your store. It is a great way to offer both pre-sale and post-sale support. If proactively used, it is a great tool to help with your marketing efforts as well. LiveChat offers plenty of options to set up a communication window on your WooCommerce store. You will be able to customize it to suit your site’s color scheme and design language. In addition, you will be able to initiate a chat with a prospective customer on your site, with the help of tracking data. Moreover, you will be able to make use of a lot of other advanced features like canned responses, file sharing and chat transcripts. They offer a free trial if you want to try it out, and the Starter plan starts at $16 monthly for one logged in agent. Automatic, personalized greetings might be a great option to initiate a chat with customers. When you have a customer, it is actually a great opportunity to market some of your other products. One of the simplest way to do this is by providing product recommendations to customers. Basically through advanced product recommendations, you can help customers know about products on your site they didn’t even know existed. Also, a good product recommendation should be able to intelligently guess a customer’s requirements based on their purchase history or browsing patterns. This plugin will help you display product recommendations to customers based on their purchase history, viewing patterns, and products frequently bought together. The plugin has an algorithm that records each of these instances, and create related products based on that. It is a great way to improve cross selling on your site, which can help a lot in improving average order value on your store. 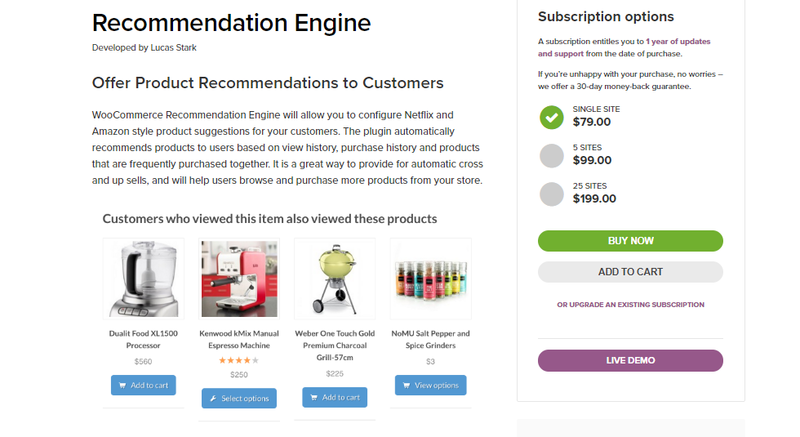 The plugin offers two widgets to display recommended products based on views and purchases. You will find a single site subscription of the plugin for $79. The 5-site subscription is $99 and the 25-site subscription is $199. Affiliate marketing is another great way to market your WooCommerce store products. One of the advantages of affiliate marketing is that it helps your product reach in a very targeted manner. Often affiliate marketers will have a good audience base, and they will be experts and influencers in the domain. When you offer an affiliate marketing program, it is quite easy to get access to experts in the domain. If your products are good, a lot of affiliate marketers will be interested to review your products and that way help it reach the correct audience. As you are only offering a commission to affiliate partners only based on sales, it might be relatively better than cost per click advertising models. A lot of successful eCommerce companies effectively make use of affiliate marketing with a dedicated team for managing affiliates. Here is a solution that will help you manage affiliates more effectively on your WooCommerce store. You can set up an affiliate program on your WooCommerce store pretty quickly with the help of this popular tool. As it integrates seamlessly with your WordPress admin, you will be able to set it up without hassles. 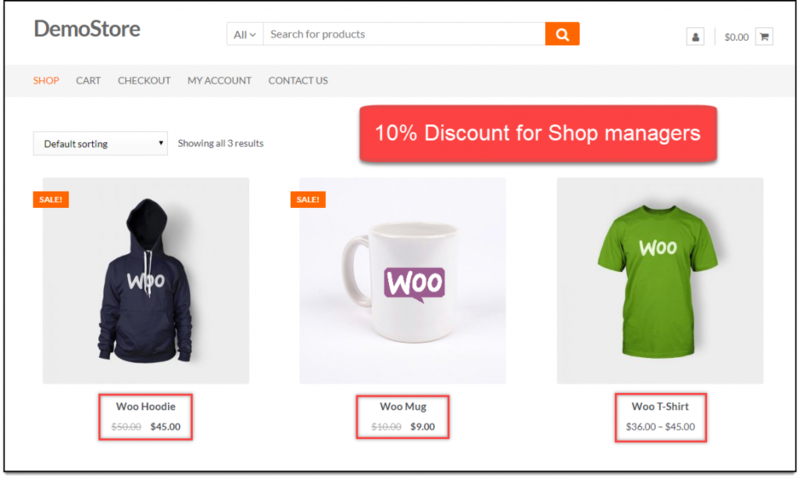 You can combine the in-built coupon feature of WooCommerce to set up discount codes specific to your affiliates. This would facilitate easy tracking on your store, as you can promptly update coupons that are expired. With the help of an add-on, you can set up affiliate commissions on recurring payments as well. AffiliateWP helps you set up a flawless affiliate program and manage it quite effortlessly. One of the challenges in affiliate marketing is the possibility of refunds. Since you are offering commissions based on sales, you have to take into account refunds also. AffiliateWP automates this process by enabling an option to reject commission payments in case of refunds. Based on your product strategy, you can set varied commission rates for different products as well. During holiday season, you might want to make bulk updates to your prices. After a few days, you might want to bring it back to the old price as well. Here is a WooCommerce plugin that will help you with this. This Bulk Edit Plugin offers a really simple way to offer discounts during the holiday season. One of the standout features of this plugin is that it is capable of handling over 10000 products at one time. So, if you have a WooCommerce store with large number of products, this is a great tool to edit multiple aspects at one go. The ELEX WooCommerce Bulk Edit has extensive filtering options to help you selectively update large number of products including variations. For example, if this holiday season you want to set up a 10% discount to all your products, you can do that in a matter of minutes with this plugin. Simply set a sale price 10% less than the regular price of all your products. Interestingly, if you want to set up different discounts for different categories of products, you can filter products by categories and apply discounts separately. More of such unique use cases of this plugin can be found in the documentation. A handy feature that you would find with this plugin is the Undo button. After each operation if you want to revert your products, you can manage it simply with a click. The plugin has an intuitive interface overall, and is quick and reliable for operation involving large number of products. A single site subscription of this plugin would cost you $69. The 5-site subscription is $99 and the 25-site subscription is priced at $199. Now, we will discuss some of the best free WooCommerce plugins for marketing that you can use on your store. 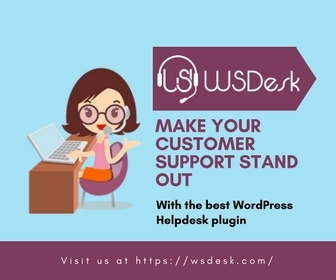 You can use these diverse plugins for improving customer experience as well as pitching your products to a wider customer base. Analyzing the traffic on your website is one of the fundamental aspects that will help you devise a more effective marketing strategy. With the help of this plugin, you can connect your WooCommerce store with Google Analytics. It provides basic tracking options to understand users, events and sessions on your website. You can also integrate basic eCommerce tracking for cart actions and product views using Enhanced E-Commerce Analytics. In addition to basic data tracking, you can track certain eCommerce specific events as well with this plugin. The plugin offers support for display advertising, as well as provide options to exclude site administers from tracking. This will give you a better picture for tracking. Fundamentally, with the help of this plugin, you can understand what products customers are interested in, what channels are driving traffic to your site, etc. You can also figure out if there are any patterns where customers are dropping out inside your sales funnel. There is a free version of this popular plugin. You can set diverse discount rules based on product weight, quantity and other criteria according to your store requirements. Moreover, the plugin displays the pricing table on the product page so that customers are well aware of the available offers. Interestingly, the plugin allows you to set up a maximum discount limit for all the discount rules that you set up on your store. This would ensure that the discounts won’t eat into your profitability. You can download the free version of the plugin from the ELEX website. Popups have a great potential to improve sales and conversions on your store. In addition to opt in forms, this plugin offers Slide Outs, Banner Bars, Notification Popups, etc. The plugin supports most of the popular form building plugins such as Gravity Forms, Ninja Forms, etc. It also supports list building forms such as Mailchimp, AWeber, etc., as well. Popup Maker, one of the popular options among free WooCommerce marketing plugins, allows you to create targeted popup ads to your customers. Selling on Amazon and eBay increases the visibility and reach of your products significantly. With the help of this extension, you can easily integrate Amazon and eBay into your retail strategy. Amazon is one of the most trusted online marketplaces. The plugin will help you list the entire set of your WooCommerce products into Amazon and eBay in quick time. You will be able to create new listings on Amazon and eBay, and also link your products to existing listings on these retail channels. You can even set different pricing or fulfillment conditions for listings on Amazon and eBay. One of the main advantages would be that you will be able to receive orders on your WooCommerce admin for marketplaces as well. Remember, the extension is connecting you to Codisto’s subscription plan, which offers a 30-day free trial. Please note, you will have to choose a subscription plan to get all the features after the trial period. Checkout our Ultimate guide for WooCommerce feed management to understand more about listing products on Google, Amazon, and eBay. Mailchimp is one of the largest marketing automation platforms in the world. With the help of this extension, you will be able to integrate your WooCommerce store and Mailchimp accounts. Once you install this extension, it will sync your customer and purchase data to your Mailchimp account. This means you can easily create targeted mail campaigns for your WooCommerce store. You can reduce cart abandonment by sending timely follow ups, as well as improve sales figures through product recommendations. You can offer discounts to your customers based on their user roles using this plugin. This would be a great option to reward customers considering how loyal they are to your store. Based on their purchase history, you can create several set of customer groups assigning them to different user roles. Then, you can offer a different discount value or percentage for each of the user roles. This way, you can create a layered discount plan on your store based on user roles. The plugin is a great option to set up user role based pricing and discounts on your WooCommerce store. 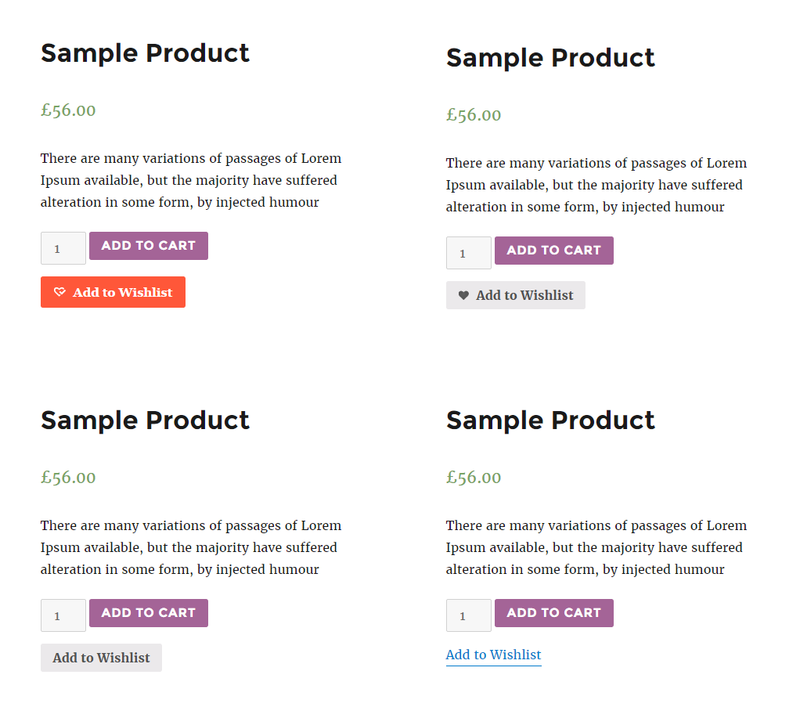 The plugin also helps to create individual pricing for your products based on user roles. Furthermore, you can turn your entire store into catalog mode by disabling the shopping functionality. The plugin is a great tool for wholesale retailing as you can create layered pricing for different registered customers. At the same time, you can disable the shopping functionality for guest users. You can even guide guest users to a contact form, where they can contact you for registration terms. You can create new user roles using this plugin. Please note, the free version of this plugin will only work on simple products. As you know, offering a wish list on your website is an effective way to improve conversions on your store. Customers, who are not going ahead with a purchase might add a product to the wishlist, instead of simply abandoning the cart. This would increase the chances of them making the purchase in a subsequent visit. Moreover, if there is an option, users are likely to share their wishlists to friends and family as well. That too can improve the visibility and reach of your products. One of the popular options for free WooComerce marketing plugins, WooCommerce Wishlist can improve the chances of conversion and repeat purchases on your online store. This plugin helps you create a wishlist option on your WooCommerce store. It offers shortcodes to place a button for wishlists anywhere on your product page or shop page. For this, you can use the pre-loaded icons or create a custom icon. The plugin also offers option to share the wishlist on various social media channels. The social share options include Facebook, Twitter, Pinterest, WhatsApp, etc. When a customer adds a product to cart from wishlist, the plugin will automatically remove it from the wishlist. Overall, this plugin can be a great help to improve conversions and repeat purchases on your WooCommerce store. When you are managing a WooCommerce, you might have customers from different parts of the world. In such scenarios, displaying prices in different currencies based on the geographical location of the customer would be a good strategy. This plugin will automatically display prices in different currencies based on the exchange rate that you have specified. You can choose to accept payment only on one currency or through all available currencies. You can display several currencies such as USD, EUR, CAD, etc. However, you need to make sure that all these currencies are supported by your payment gateways as well. The plugin even recalculates coupon values based on the rate of a particular currency. You can add a fixed rate to a particular currency irrespective of the exchange rate, as well as customize the symbol for each. The plugin also offers an option to display the price automatically based on the location of the customer. It is compatible to several popular plugins such WooCommerce Subscriptions, Product Bundles, etc. This is actually three plugins in one. The first one helps you market your WooCommerce products through Facebook. With the help of the other one, you can in fact sell your products on Facebook as well. There is also an option to integrate Facebook Messenger on your website so that you can engage your customers more effectively. So, this plugin is one of the popular free WooCommerce plugins for marketing as well as an option for multi channel retail. You can optimize Facebook ads in a a more targeted manner using this plugin. It also offers an option to connect your WooCommerce store and Facebook, so that you can re-target your website visitors. 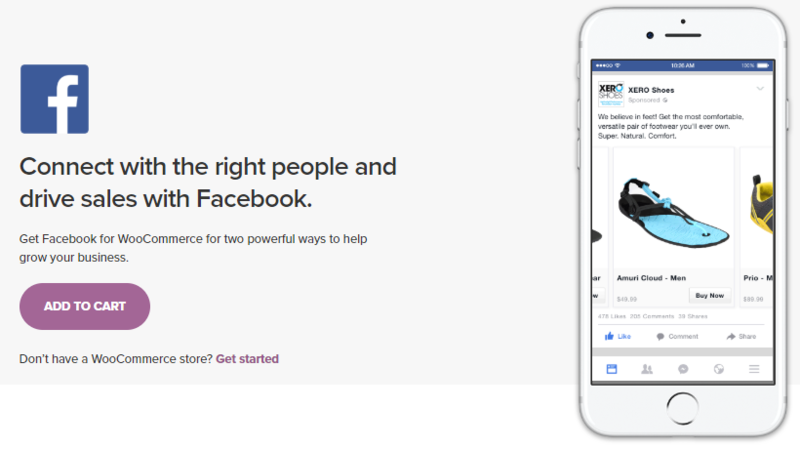 With the Facebook shopping integration, all your WooCommerce products will be synced to Facebook real time. Any changes to your catalog will reflect on the Facebook listing as well. Similarly, the conversations on Messenger too will be synced. To follow up with a past conversation with a customer, you can simply open the conversation on messenger. Since social media strategies are important for any WooCommerce owner, this free option is definitely one you can try. Growing your email list is an important concern for your marketing efforts. As the list grows you will be targeting more users and prospective customers. One of the innovative ways to grow your email customers is this plugin. It helps you create a wheel of fortune on your store, that offers coupons, discounts, etc, to site visitors. You can create multiple wheels using the predefined themes of the plugin. And, it helps you capture emails to your Mailchimp account, so that you can build your email list. 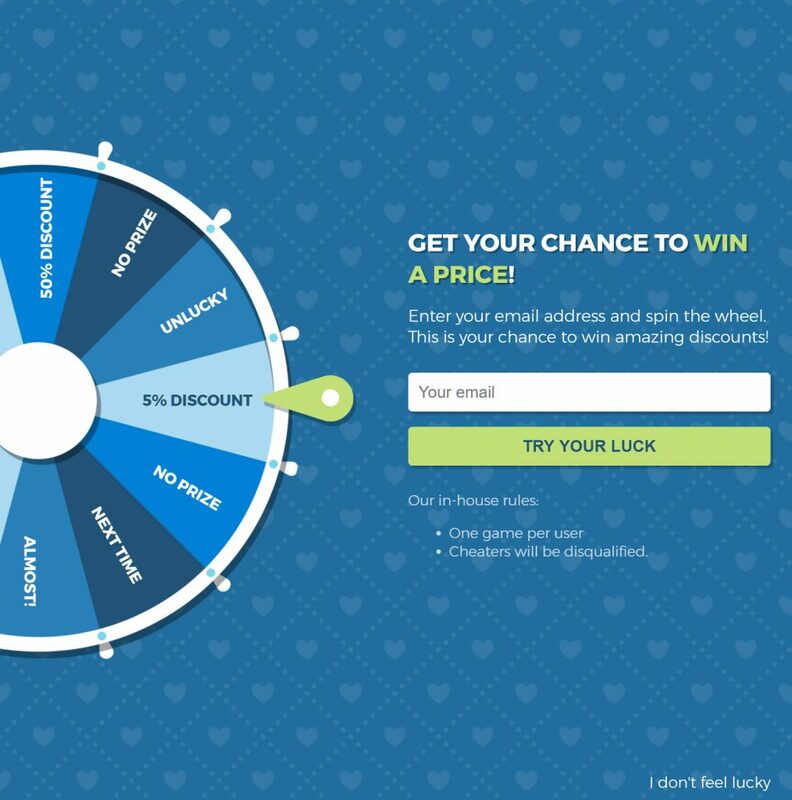 A notable options among free WooCommerce marketing plugins, this plugin helps you grow your email list by setting up a wheel of fortune to capture email ids. Live chat has great potential to resolve customer issues real time as well as in lead generation. This plugin will help you integrate Facebook Messenger on your website, so that your customers can interact with you more easily. The plugin saves the chat history, and hence you can use past conversations to remarket your products to customers. 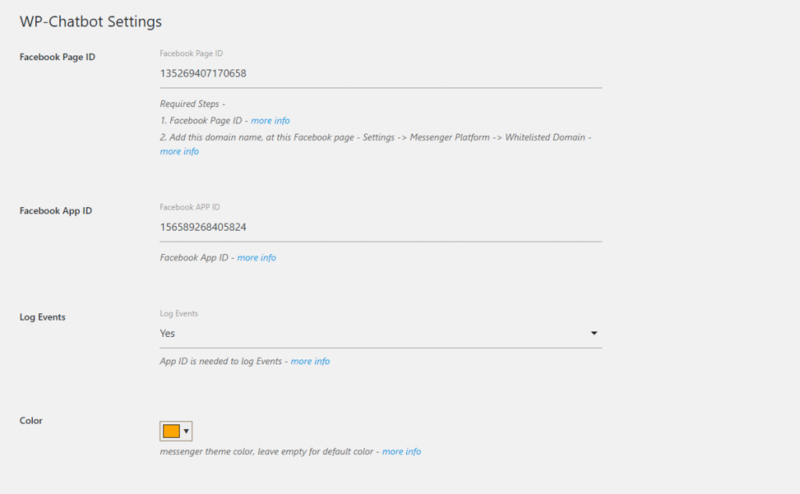 Based on category, post id, user’s device, etc., you can selectively hide messenger as well. The plugin also allows you to customize the color and language of Messenger. More importantly, you can set up greetings message for logged in and logged out users. Integrating Facebook Messenger will help you improve customer engagement on your store. Setting up a range of quality products in a neatly organized layout is not enough to ensure the success of your WooCommerce store. You may need to combine a set of innovative marketing initiatives to ensure customer engagement and brand awareness. This may range from email marketing to creating awesome pricing strategies. The list of options mentioned in this article would help you find effective assistance in your marketing initiatives. These are some of the best WooCommerce plugins for marketing currently popular among store owners. Let us know what you think about this list by leaving a comment in the below section.